Check out our new digs at http://jdcentwine.org. Blog: http://jdcentwine.org/blog. Today was Wednesday, day 4 of the trip, and what a packed day it was. The day began as per usual; davening followed by breakfast, but took a slightly different turn when, instead of hopping on our bus, we remained at the hotel to be honored with a guest speaker. Josh from Heart to Heart enlightened us with a talk about the organization he’s affiliated with, heart to heart’s history, its goals and its projects. Also interesting about that talk was that it gave us a fascinating perspective of an American living in Ayiti’s outlook on the country’s wonder, as well as its flaws. 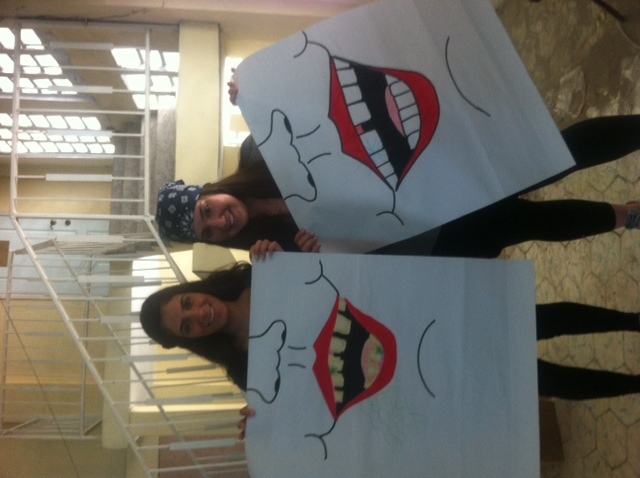 After that we were off to school for the third and last installment of our projects with the kids: oral hygiene/health day. 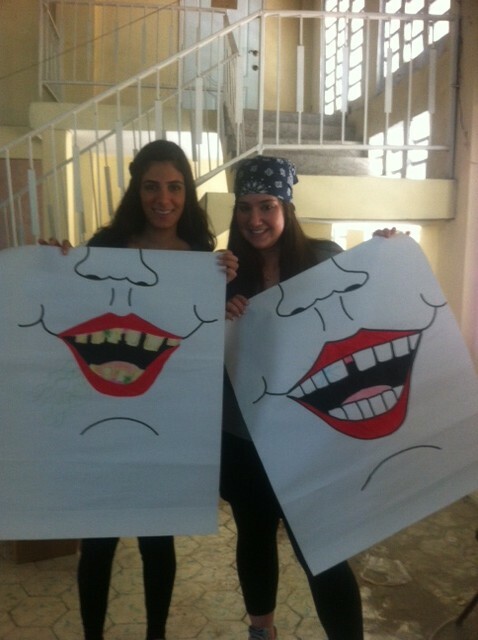 We held up posters of dirty, unhealthy teeth, and explained to the children how to make sure that their teeth would stay nice and healthy. Each kid walked away with an exciting goody bag filled with a toothbrush, paste, and floss. Then all the kids made a circle around us and we transmitted a message of physical exercise by teaching them ‘cotton eye joe’, ‘the Macarena’, and ‘head-shoulders-knees-and-toes’, (which the kids loved and even taught us their own haitan version of the song!) After emotional goodbyes with our children whom we so closely bonded with these past three days, we traveled to a very old mansion in Petitiontville for lunch and a tour given by our very own Lionel. Next we returned to the Heart to Heart building to put the finishing touches on our clinic. We finished up painting, cleared out age-old trash that was piled up in corners, applied varnish to walls, and swept and cleaned the floors one last time. Confident that our work would be left in good hands, we finished up, admired our work, and returned to the hotel to clean up. Instead of having dinner at the usual time, we had the privilege of driving to the house of Maryse Panette Kedar at the Prodev office, who explained to us her efforts in solving Ayiti’s various crises mainly through targeting the uneducated, and the importance of each of us striving to help the world out any way we can. Her wisdom and charisma really inspired us to yearn to make an impact in this struggling world. Lastly, after more dinner and bonding back at the hotel, we were enlightened by yet another of (Rav) Adam Berman’s deep and thought-provoking sessions. Tonight he entertained the notion of ‘Chosenness’ of the Jewish people, what that means for us and how it affects our relationship with non-jews, and the differences between responsibility and superiority. We broke up into pairs and read discussed various sources, whether it be from the Torah, from the Rambam, Rav Hirsch or others. Although by the end of the session we were physically exhausted and tired, our minds were fully awakened. 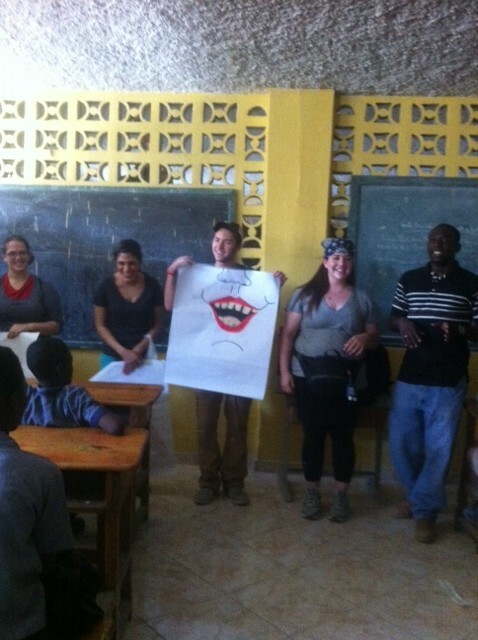 That wraps up Day 4 of our trip to Ayiti. To me, the most inspirational part of today was seeing just how happy the men from the clinic were, how thankful they were to us for all that we did for them, and how excited they were to put our work to good use. PS – Happy 2nd anniversary to Jon and his wife! going back to the school for a second day was a truly meaningful experience. Any hesitation or separation that we felt on the first day completely dissolved when we reentered the classroom. The kids were excited for our return and even brought their projects (all about me) from yesterday back to school. We got to really connect to them on so many levels by teaching them and singing with them. Though communication is difficult this separation disappears in song. We united by tunes and tones from both of our cultures. This was a great follow up to the science experiments that we did with the kids. We taught them about engineering and architecture by building bridges, “pons”, out of toothpicks and gummies. We introduced them to the fun in chemistry by creating a chemical reaction with vinegar and baking soda – an exploding volcano. This message was only furthered when they got to mix and keep their very own silly putty. It was so meaningful to see how much they learned and cared to experience all the lessons we aspired to teach them. During our mid-afternoon lunchtime break we were privy to attend the Haiti historical museum. There we learned about the Haitian history – from the time before the colonization of 1492 (Christopher Columbus) through the Haitian revolution, and ultimately learning about their recent history and current challenges. It was interesting to see the influences of outside cultures on the Haitian society. We learned of the introduction of Vodo to the religion, the separation of French Haiti from the Spanish DR and so much more. Josh R – I really enjoyed the museum; learning about Haiti and its history. Davina S – i loved singing and dancing with the kids in the classroom. We sang both American and Haitian songs uniting the culture. Melissa A – it was really fun making the silly putty with the kids. They were excited to learn about it and the process of making it. Michal W – walking into the school and seeing the kids that remember me from yesterday and coming over and give me a hug. Adam B – learning and discussing with team everyone. Talya L – while driving we passed a Haitian painting of the “Last Supper”. It was interesting to see that amongst the other Haitian art another cultures famous piece entered the mix. Avi A – I really enjoyed building with dots. Everyone really came together to achieve one goal. The kids got to experience group work and individual work by getting to build their own bridge. Calixte Y – my favorite part was the volcano project. This was my first time watching this project be done and it explodes like a volcano. The kids really enjoyed it. Devora W – I was really impressed with the kids interest in what we were teaching them in our hands on learning. They had a lot of patience and concentration and wanted to take the time and effort to do it on their own. 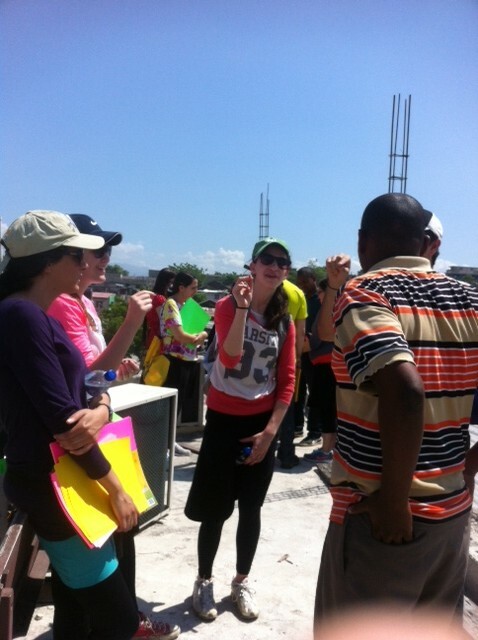 Shauna R – watching the students at YU interact with the Haitian students of Heart to Heart. Aliza A – The united singing and dancing and cross cultures. After our first day of getting a little taste of Hatain culture and history, we began our second day a little differently. 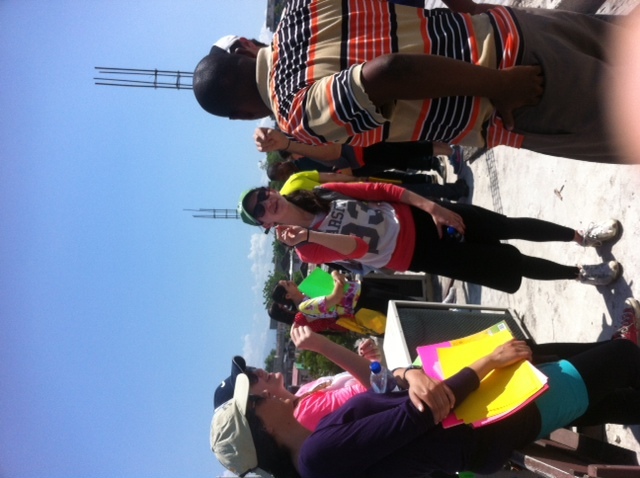 We started off our day in Bel Air, which is downtown Port-au-Prince. As we drove through the area, our tour guide informed us that Bel Air is one of the poorest and most dangerous areas in Port-au Prince. The real work started when we arrived at the Heart to Heart Clinic in Bel Air. We were taken to the rooftop to assess the city from up high and to see some of the damage that the earthquake did to the area. Heart to Heart is an organization that has set up a clinic in Bel Air that serves about 20,000 people who live in that area. JDC has been a partner of Heart to Heart since the earthquake, providing necessary medical equipment, care, and education. We were taken a back when we saw the one dentist that only sees five to ten patients per week. This is the only dentist in the entire area that is able to serve the thousands of Hatians who seek medical help. In addition to seeing patients, the clinic also has a pharmacy and a lab in the same building. 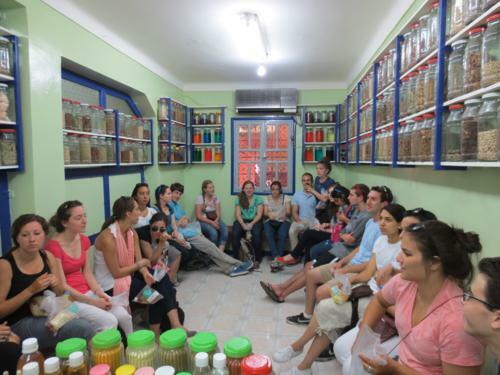 When we took a tour, we saw many patients waiting to be seen by the pharmacist. Heart to Heart has also established a school downstairs. We were told that classes are composed of children of all ages and that attendance is not necessarily consistent, but they are trying to encourage a culture of education. We had the amazing opportunity to teach the Haitian children that attend this school, and we will also do this tomorrow and Wednesday. In preparation for our trip, we had decided that we wanted to do an “About Me” project with the children. We really wanted to be able to come away with a better sense of the children and their culture, as well as share something about ourselves. The students were split into three groups. Each student decorated a paper with what they thought represented themselves. They were told to include their dreams, hobbies, and favorite things. We went around and took Polaroid pictures of each of them, and they attached the pictures to their decorated paper. The children were fascinated by the Polaroid picture and how instantaneous the picture was printed. The art projects were really beautiful and served as a self-reflection for each of them. 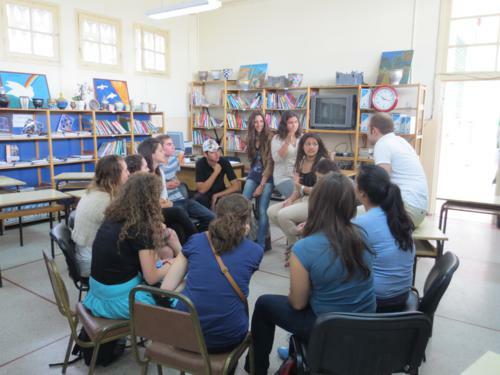 We were overwhelmed with a classroom full of students, as other students started to join our group. We were embraced by children of all ages. It was truly amazing to see how we could all connect with the children, even though we could not verbally communicate. The only phrases we could say were, “what’s your name” and “how are you,” and we had to rely on translators for anything else. 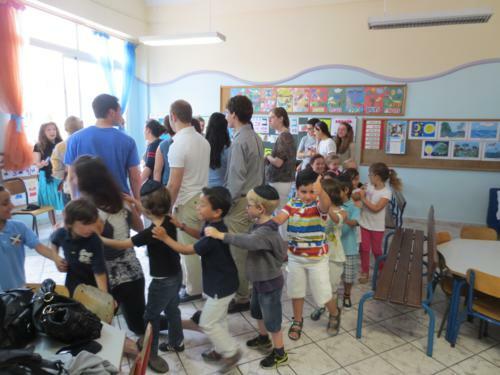 However, the language barrier did not stop us from forming a connection with the children. It was really a moving experience to see their happiness from the session. We ended the session by singing and dancing to popular songs that both we and the children knew. After we parted from the children and told them we would see them tomorrow, we had lunch on the bus while we saw more of downtown Bel Air. 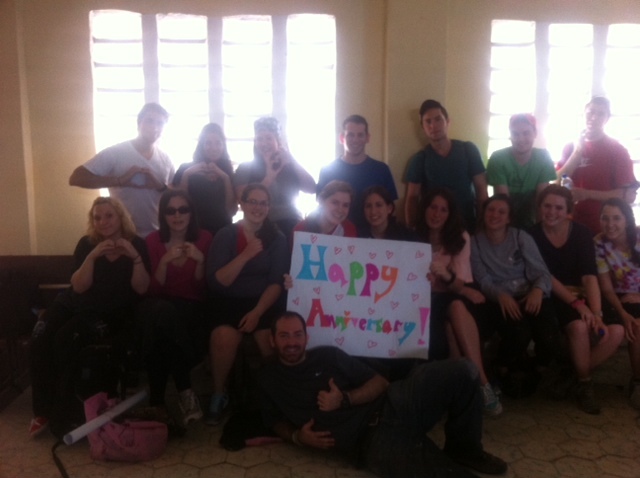 The group then headed back to the Heart to Heart clinic to work upstairs on the actual clinic. Today we focused on painting a wall of the clinic that was covered in grime and fading paint. We first sanded the wall and then began to paint it. We followed the instruction of other workers in the clinic. The walls of the clinic were chipped and dirty, and it made a huge impact to be able to brighten this area for the patients. When someone is ill and has to go to the clinic, it gives the patient more dignity to be able to go to an area that doesn’t look like it is covered in a layer of dust and dirt. The changes that we are making to the clinic are going to enable the patients to feel more comfortable in coming to seek medical attention. That was just the beginning. Over the next two days, we will be building an office for the clinic so that the patients can be consulted by a doctor in privacy, rather than out in the open, as is done now. One of the other workers in the clinic, Jimmy, expressed how excited he was for us to finish this project. We are truly honored to be working on this project, as we have already seen the impact it has on the spirit of the Haitians around us. When looking back on my first day in Haiti, I am honestly at a loss for words. Today has been nothing like I have ever experiences and I’m sure I can speak for the majority our group on that statement. For all we saw and heard on our first day, I’m not certain were in for a truly powerful and emotionally-packed week. It became clear to me early on that every scene and every image I was to encounter would be significant – in beauty and in destruction. It was an iconic start to our day when we were welcomed to the Port au Prince Airport by a band, perhaps hired by the airport or the government to impart a good impression to tourist before entering the crammed and hectic airport scene unfolding inside. My first thought was how this airport must have looked during the earthquakes initial aftermath. We hasn’t seen anything. Our local guide Lionel has a huge personality, eager to educate us on the complex history of his native homeland. 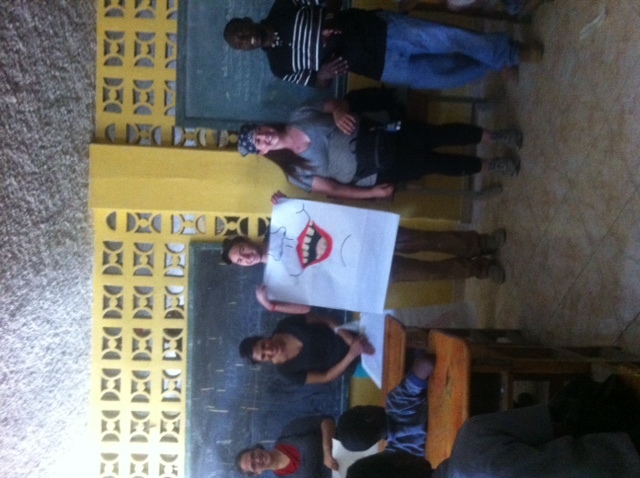 Jderhy, the JDC representative in Haiti is helping us along the way in our journey. Riding in our van across this capital city, there’s an overbearing sense of culture shock; feeling as though this all may be a figment of my imagination or a scene in a movie about African blood diamonds or some obscure documentary I may have come across while flipping channels on the TV. The sight of UN vehicles casually riding past impoverished neighborhoods is somewhat disturbing, conjuring up questions from the group to Lionel about government corruption and drug wars. We encounter a torn nation, saddled with serious challenges but at the same time seemingly hopefully to overcome them and become stronger. We visit a clinic that is run by JDC’s partner in Haiti, Afya. There people paralyzed or severely injured by destruction are finding new ways to continue living in hope with state of the art prosthetics and intensive rehabilitation. Seeing the work some of these organization do for people who would otherwise be ignored is nothing short of inspirational. And there’s a deep respect found when driving through the streets of Port Au Prince. The entrepreneurial spirit of every single Haitian at the side of the road, selling shoes or electronics or artwork to get by says something profound about these people. At the end of the day we pass the government palace. 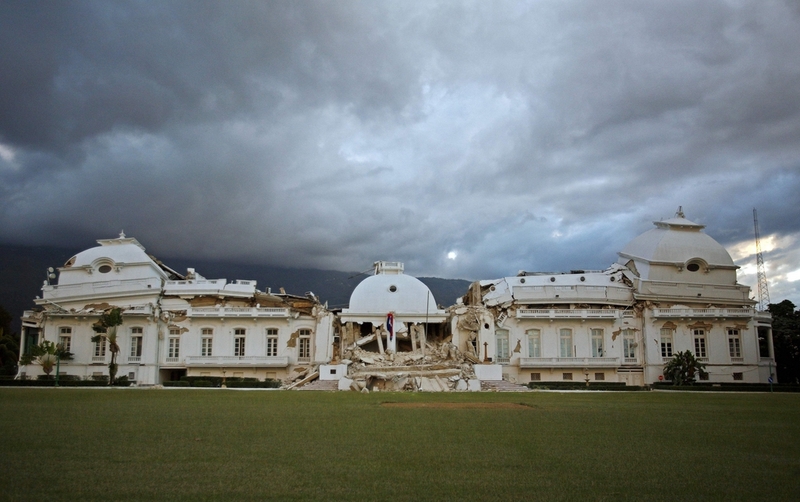 The image of it in ruins post earth quake epitomizes the image of a paralyzed government crumbling down the beautiful fortress that is their very country. Though, the buck doesn’t stop at the states failures alone, there is a plethora of tangled history in many aspects of the society as well. But, for all there is to say about the failures and challenges, I cannot ignore the overwhelming feeling of opportunity for the Haitian people. Through the next few days, I pray I can help build on those feelings and help envision a better future for some of these incredibly brave and fascinating people. 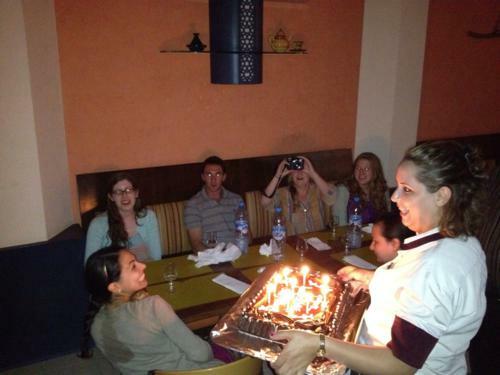 Sunday 4, June (a.k.a Shayna’s Birthday) began with our departure from Marrakesh. After a long nap on the bus, we arrived in Casablanca where we visited the only Jewish museum in the Arab world. 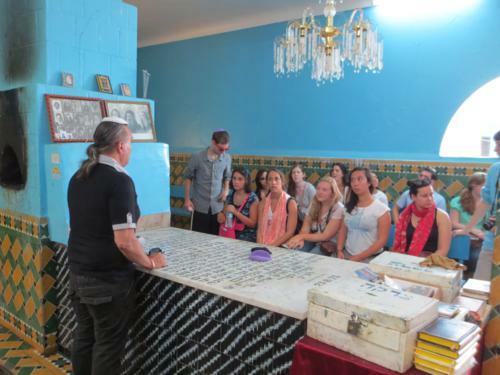 Our amazing tour guide Rafi played a significant role in the unearthing of many of the artifacts we saw and the restoration of many important and historic Jewish sights throughout Morocco that were featured in the exhibits. We were really impressed with the wealth of information we found at the museum and easily could have spent much more time exploring the exhibits, but unfortunately we were on a tight schedule. After leaving the museum, we visited the second high school in the Alliance school system, which has all Jewish students. We ate lunch and talked with the students in their canteen, although many of them didn’t speak English so well. With typical teenage attitudes, some of the students were engrossed in texting while one boy tried to convince Rachel to eat couscous with her hands. At first we were a bit frustrated with all this, but then we realized that we probably would have done the same thing if we were fourteen. Obviously, as cliché as it is kids all over the world really aren’t that different. On the other hand, these kids were more dedicated to Jewish custom than any of us ever were. The lengthy prayers recited daily after lunch really impressed us and we were again reminded of the strength of the Moroccan Jewish community, especially in Casablanca. 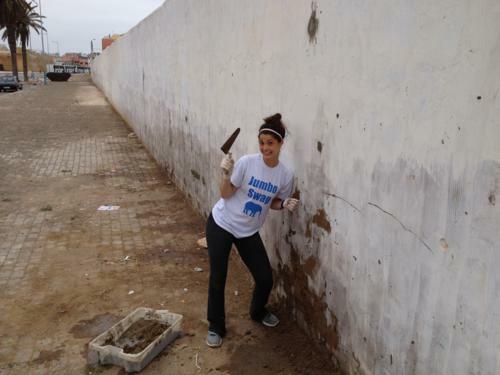 From the high school, we drove to El Jadida, a coastal port and resort town about an hour away from Casablanca, where we immediately began our work restoring a Jewish cemetery. 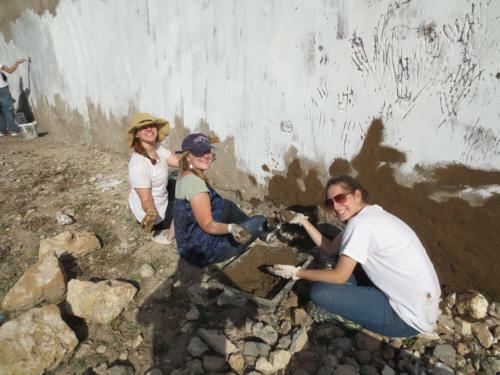 Most of us had no idea what to expect from this experience, and we were put to work painting and patching the outer wall along with clearing a large pile of gravel and sanding the main door. Although most of us aren’t used to this type of manual labor, we enjoyed our experience and spent a large portion of the day singing and dancing to pass the time and keep our energy up. By the end of the day we had finished one side of the entire wall and felt quite accomplished. As always, our hard work ended with a cup of Moroccan tea along with homemade crepes and pastries baked that day by the sister of the cemetery’s guardian. We returned to the hotel excited to shower and clean the paint and cement off of our bodies. Despite the lack of water pressure, we pushed through and headed down to our group check-in by the hotel’s pool. Here, many of us discussed the physical work we had that completed that day in comparison to the previous work we’d been doing, which involved mainly unseen products in the form of social connections and learning. After we struggled with this idea, we headed in for a dinner of warm soup and bread, fish, and of course, birthday cake!!! Over the day, we had tried to sing happy birthday to Shayna in the six languages that our groups can speak (English, Spanish, French, Hebrew, Arabic, and Russian), and completed this task after dinner. Thanks to Simone, who picked out the dessert, the cake was absolutely delicious and despite being full from a great dinner, we ate it all anyway. After a long day, many of us didn’t have much energy left, but we all hung out together to celebrate Shayna’s birthday. After an hour or so we decided to retire to bed as we had a long day of work ahead of us tomorrow. I’m sure that we were all amazed that in one day we managed to tour three cities, renovate and entire wall, and still keep our spirits up. We certainly felt that we had left a mark with the work that we had done that day, and were excited to further continue our renovations on the cemetery the next morning. Making our way through the Marrakech square to reach the medina was a challenge. Snake charmers, fortune tellers, and a slew of persistent salespeople all vied for our touristy attention. However, the expertise of our peerless and fearless guide, Rafi, led us in the right direction. 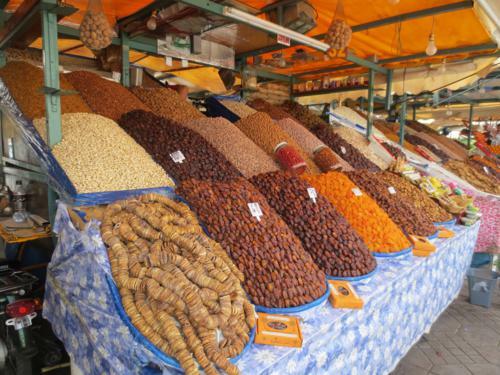 The medina is essentially a covered market, housing a plethora of shops selling a variety of Moroccan goods. Through a maze of alleyways, Rafi found a small staircase that took us into an air-conditioned room that felt alien to the midst of the commotion that is the medina. The walls were lined with jars of spices and other interesting unidentifiables – an apothecary. The employees showed off an impressive array of spices, cosmetics, and home remedies, prompting most of the group to do a little shopping. We were then let loose for some free time to peruse the shops and test our bartering skills. Backpacks full and pockets a few dirhams lighter, the group returned to our hotel for another reflection session. We opened by discussing our experience the previous day, when the Jewish woman in Marrakesh appeared to emotionally break down and urge Simone to do more for her. However, the group reached a consensus that the JDC, as a philanthropic organization with limited resources, is only responsible for providing for her necessities. Only a more proactive approach on her end to working with the organization could bring her happiness. This introduced a conversation about the larger issue of how a hypothetical Jewish philanthropic organization should go about ordering its priorities. We concluded by listening to Evan explain in detail the JDC’s opinion on the matter and the nature of its global operations. 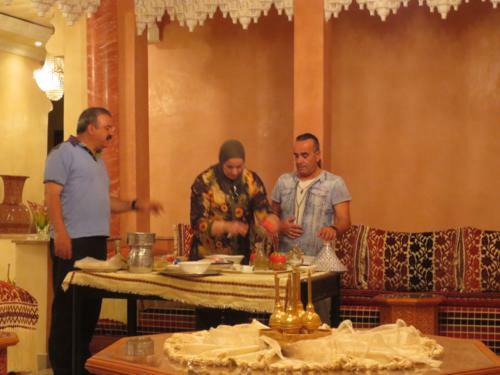 Afterwards, we visited the house of Jamal, a friend of Rafi’s, for a cooking lesson and dinner. Many of us were puzzled how an apparently ordinary friend was going to fit and feed all twenty of us in his house, but it turned out to be a veritable mansion. The meal (four courses, as always) was as delicious as the decorations were exquisite, and a good time was had by all. Though Shabbat was a day of rest, today was a day to connect to Morocco and its culture. We began the day by visiting the Jardin Majorelles, a beautiful garden designed by Jacques Majorelle at the beginning of the 20th century. In the gardens we saw beautiful Moroccan architecture surrounded by lush foliage. After that quick stop we headed out to the Atlas Mountains, to spend time in a Berber village. The Berber people are native to the south of Morocco and greater Maghreb region, and significantly predate the Arab population. The village that we visited once had a Jewish population that was quite large, but all have now moved to other places. No visible sign remained to show that Jews had ever lived in this village. 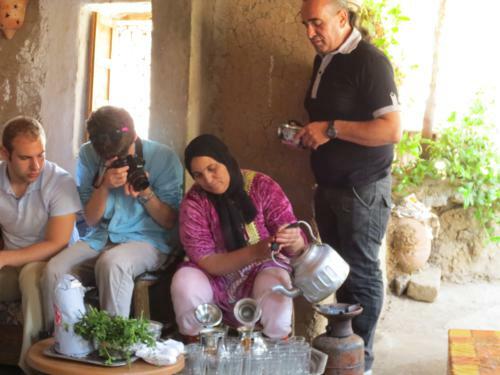 We sat and saw the process of making Moroccan mint tea; it is a much more intricate process than making any tea we have back home. On our way out we were hounded by men trying to sell myriad pieces of jewelry, daggers, and tzachkes. After leaving the village, we visited a memorial for a Jewish Rabbi, Rabbi Shlomo bel Hassen. The memorial was built in 1976 following a donation from a woman whose wishes were granted after she visited the grave of the Rabbi. It was especially surprising for us that there was such reverence paid to this 14th century Rabbi – until only a few month ago a man lived in this memorial complex, taking care of it and allowing visitors to pay their respects. Visitors come often, on holidays, to ask the Rabbi for answers to their wishes. After placing candles in the chimney near his grave we headed back towards Marrakech, with a quick detour for a camel ride along the way. Before heading to Marrakech for a few days, we stopped by two schools that are part of the Alliance school system which operates four schools across Morocco. 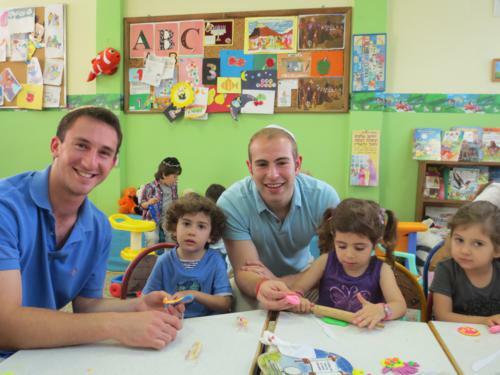 We first visited the Alliance Kindergarten, serving children ages 2 – 5. The oldest children welcomed us by singing a few songs in Hebrew. Then, as a special treat, they sang a song we all knew very well and we were happy and we knew it! The adorable students played with us outside, showing us their playground and their strong muscles as they did push-ups. We each left the school with a rose for a happy Moroccan Mother’s Day (hi moms!) and headed to the Alliance Maimonides Secondary School, serving students 10 – 18. 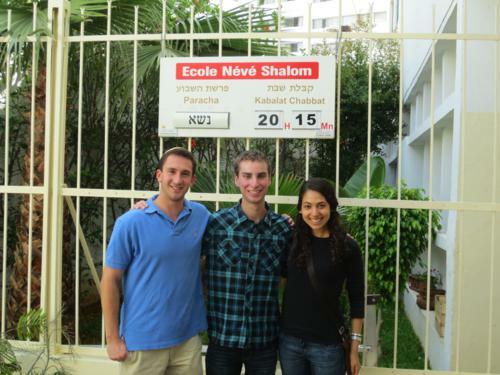 The school is 60/% Muslim and 40% Jewish – very indicative of the religious tolerance we have found throughout our trip. A few students were gracious enough to speak with us (in their extremely impressive English) about their experiences. We asked what it is like attending school with students of different religious backgrounds: “Normal. It’s just normal.” was the response. The principal of the school echoed our thoughts: if only the whole world could emulate this mentality. 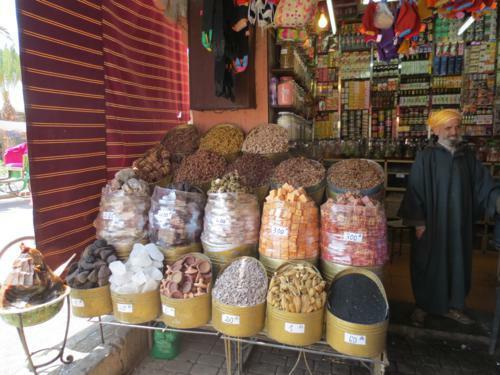 We had a three hour bus ride to Marrakesh, a vacation destination for Moroccans and tourists alike. As we approached the city, the entrance to the desert – we were greeted with the sights of camels, cacti, and berber villages. Marrakesh has a population of about 3,000,000, approximately 200 of which are Jews. 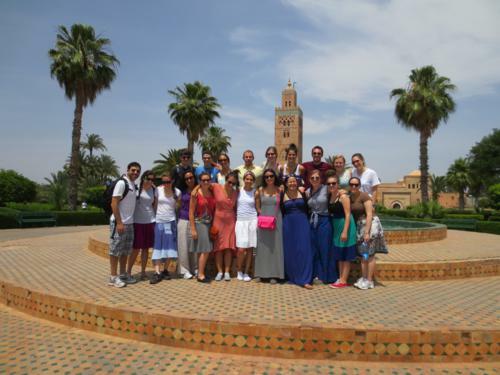 Our first stop in Marrakech was a tour of the Jewish Quarters. We met an elderly Jewish woman who lives alone with the assistance of JDC. Her five children are all grown and abroad, while her husband is terminally ill and stays at the elderly home we visited in Casablanca. We were supposed to converse with her (with the help of our translators) and hear about Jewish life in Marrakech, but instead watched on as she divulged the reality of her situation to the translators in Arabic. As she began to cry and lament her poor living conditions and loneliness, it was disheartening to realize that despite all of JDC’s hard work, its resources are limited, and some things like lonesomeness do not have easy solutions. While it was discouraging to see her struggles, it was a very eye-opening experience to understand the reality of Jewish life inside the Mellah, the Jewish quarter where only 4 Jews reside. As we left her home, we realized that this experience was not so different from the American experience: elderly parents and grandparents, despite health needs and loneliness, are often resistant to leave their homes. Finally we went to Shabbat services at Synagogue Beth El. All of the Jews in Morocco are Modern Orthodox, and Beth El was no exception. This meant that at all of the women were separated from the men, a new experience for many of us on the trip. Women participated in a side room that looked on to the main sanctuary. Perhaps for the girls especially, this experience caused mixed emotions and is something to think about both here in Morocco and when we get back home. After the service, we joined the community president, his wife, and Jewish community members for dinner in the synagogue courtyard – a fantastic meal under the stars. In true Moroccan fashion, we were served course after course – appetizers, fish entrée one, fish entrée two, chicken entrée, tea and dessert. We walked back to the hotel, taking in for the first time the busy Marrakech nightlife. Flashing lights, music, bars, and night clubs, adorned busy streets, and we joked that we were once again college freshman desperately searching for a party. When we returned to the hotel, we celebrated Oneg Shabbat by relaxing poolside. We are so grateful for the hospitality of the Moroccan people. The room and board, not to mention the copious amount of food granted to us has made us feel like a welcome part of this Jewish community. 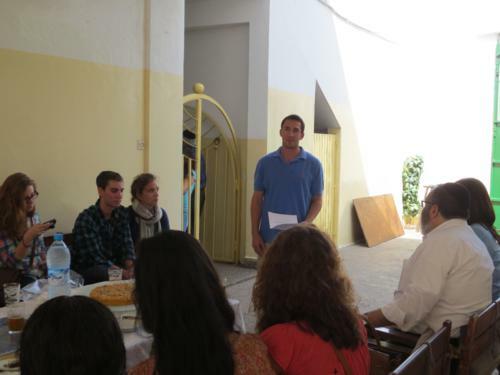 On our second day in Morocco, we visited Neve Shalom Ozar Hatorah, a Jewish primary school in Casablanca. The school staff and students were very excited to have us there. 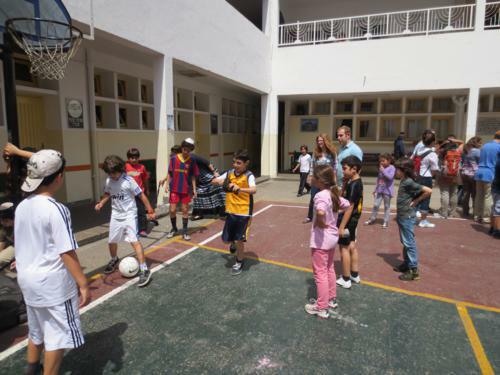 Throughout the course of the day, we got to visit and participate in their classes and activities, including Hebrew, French, Arabic, theater, geometry, sports, and arts. It was especially meaningful to spend time in the computer class because before the trip we fundraised to buy computer operating systems for the school. We sold popcorn to Tufts students and their parents and raised a total of $650. We presented the check to the director of the school, who was very appreciative to both our group and the JDC for the support. We were very impressed with the quality of education, because the academics are at a much higher level than at most Moroccan schools. It was also great to see the enthusiasm of the students, who were engaged in their classes and were especially enthusiastic about singing songs. The students’ smiling faces were gratitude enough, but on top of the fun day, Neve Shalom made us feel like royalty during lunch time. In traditional Arab custom, guests are shown respect by being presented with platter after platter of food. After we filled up on bread and salad and chicken the veggies came out. When we thought there could be no more food, out came the couscous and chick peas. Don’t forget about tea and dessert! 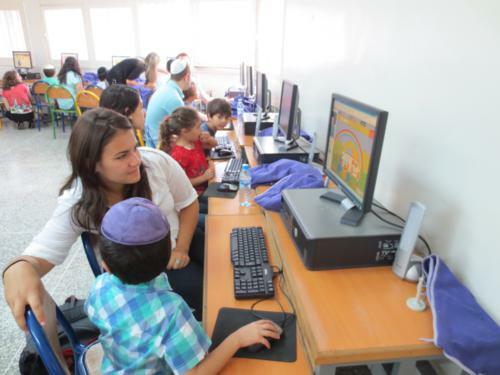 It seems like the Jewish schools are at the heart of Jewish life and identity in Morocco, as almost all Jewish children attend a school like this and receive a Jewish as well as academic education. JDC works with the community to make sure that this opportunity is accessible to everyone, subsidizing the tuition for families that can’t afford it. The day was well spent, and we learned that playing with children requires no common language, just a willingness to connect. We look forward to sharing the photos and stories with our friends and family at home.